More travel for me, I’m off to Italy and historic Milan for just over a week. This is an offshore business course, part of my degree program at Babson University. We’ll be collaborating with students and professors at Bocconi University, as well as visiting Italian businesses like Autogrill, Lamborghini and Ermenegildo Zegna. Not all the time will be spent in business wonkitude, however. 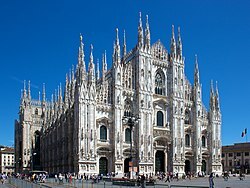 We’ll visit the famous duomo, masterpiece of late-gothic cathedral architecture. Also on the agenda, a visit to La Scala, world-famous opera house … opened in 1778, La Scala was famous as a place for assignations with courtesans as much as for opera. Of course, so many operas are about courtesans its hard to keep all that straight. Other cultural highlights of the trip describe the complete spectrum of the Milan-experience: Sunday morning we take in a soccer game at Stadio Giuseppe Meazza, and then Sunday afternoon, we visit Leonardo’s The Last Supper – from the athletical to the ecclesiastical, if you will. I’m really looking forward to seeing Leonardo’s masterwork. One thing on my mind as I pack for the trip: How will I dress? Of course I’ll be instantly identifiable as an American, but at least I’ll be leaving at home the fanny-pack and cargo shorts. The fantasy look I have for Italy is typified by Aurelio Zen – portrayed by Rufus Sewell, shown at left. This guy can wear a suit. Its 50:50 if I will post while I’m away. Hoping to capture a lot of pix – will share when I get back. So, A dopo. I returned from India last Friday, but between jet-lag recovery and work-catch up haven’t been able to do any blogging. Overall the trip was very successful … I got to see operations at the IBM Pune Lab and speak one-on-one with the whole team there, and spoke to 4-5 customers at Lotusphere Mumbai. 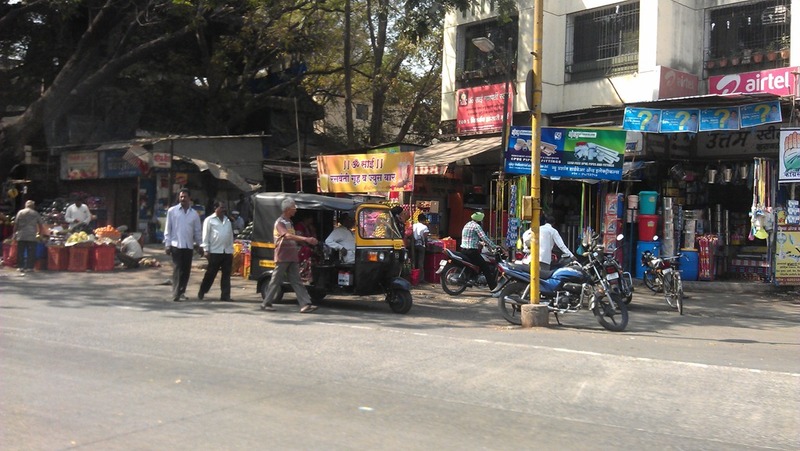 A few more photos from the trip … here’s a pretty common street scene from Pune. You see an auto rickshaw, the three-wheeled thing in the middle-left. These are ubiquitous; I’m sure I’ll ride in them on subsequent trips. You also see some examples of commerce, in the form of a plumbing supply company, or so I gathered. Something that struck me on this trip was how every square foot of the city was filled with some sort of business or another. 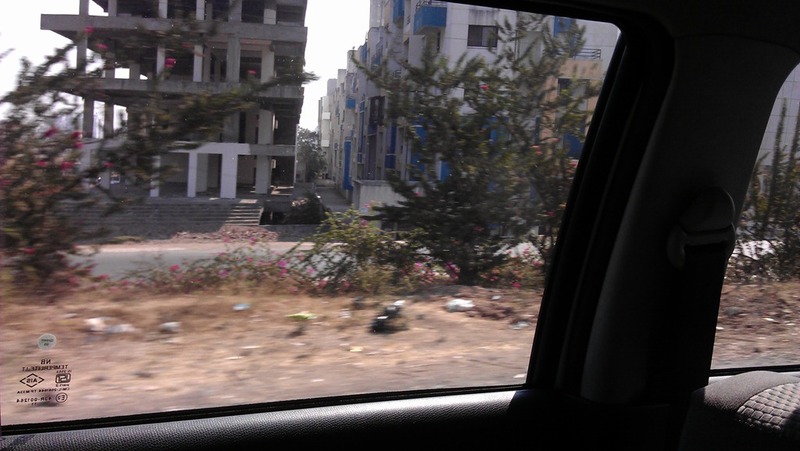 Here’s another common thing I saw – buildings half-constructed. Most were surrounded with bamboo scaffolding, and seemed empty of any occupation of activity. Asking my Indian colleagues about this they explained there has been a burst real-estate bubble in many regions of India, and that there are indeed a great many abandoned projects – many of these are housing developments where owners have already paid only to see the builders go bust. Last photo. Yes, there is no place on earth where Scottish food cannot be found. When we were driving from Pune to Mumbai this is where I had breakfast. I was holding out for some traditional food, but my colleagues all assured me this would be faster. 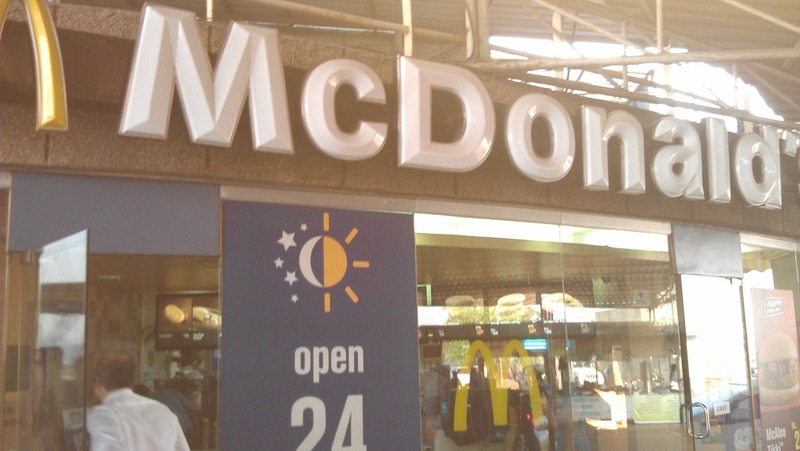 It was fast, and the veggie McMuffin I ordered actually wasn’t bad – chick peas, corn, cilantro and curry were the main identifiable ingredients. Tasty as it was, I don’t expect this to come back to the US any time soon.